Do you know that feeling… Running on new trails, not knowing where the path will take you? Then, you turn a corner, and you find some of the most stunning views you’ve ever seen? Like you found the black pearl, the hidden treasure, the pot of gold at the end of the rainbow? That’s the feeling I had during the Engadin St. Moritz Ultraks trail race. 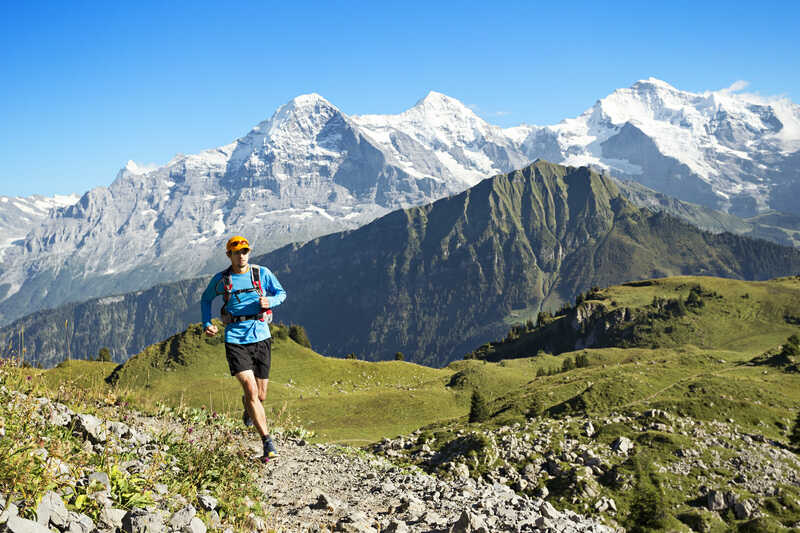 Engadin St. Moritz Ultraks is a relatively unknown gem, overshadowed by the success of its big brother, the Matterhorn Ultraks trail race series. But, it’s an event that deserves all the stars it can get. I give it straight A’s — and then some. Located in Pontresina, near the famous ski town of St. Moritz in the southeast corner of Switzerland, Engadin St. Moritz Ultraks might be a little hard to reach, but the beautiful journey is part of the full experience. The scenery here is like nowhere else in Switzerland. It’s wild, raw, untouched, rough and, I confess, a little intimidating knowing that we would be running around those mountains. However, the trails selected for the race courses were perfectly orchestrated: a mix of runnable dirt, steep rocky uphill and crazy technical downhill, alternating with gentle-grade runnable ups and downs. While running, we were treated to panoramic views on snowy high-country peaks, glaciers and rugged mountain ranges, mixed with views of the towns and lakes of Pontresina and St. Moritz. The Engadin St. Moritz Ultraks event offers three races along with a fun kids’ run. In other words, there’s a race for every member of the family. The 16-km “Pitschen” might sound like a good choice for a novice trail runner, but keep in mind that although the distance isn’t particularly long, there is a significant amount of climbing (translation: 1,300 meters, or over 4,000 feet). The altitude of the course — starting at 1,800 meters and reaching a high point of 2,750 meters — will also cause you to slow a bit. However, the views are absolutely stunning. The trails aren’t too technical — so long as you do your hill repeats before race day, you’ll be fine. The “Media” race consists of 30 km (31.5 according to my Suunto) and 1,700 meters of vertical. After an easy, runnable 7-km forest trail along the river, you turn onto a trail that leads right up a mountain. The biggest climb of the day then gets thrown in your face. Thankfully, at this point your legs will be nicely warmed up. While climbing, don’t forget to look up from the trail now and then! Topping out at 2,750 meters at the top of the ski area, you can see St. Moritz far below. That’s exactly where you’re going next. A very rocky and technical downhill with lots of streams and mud — at least for us in this edition of the race — makes for slow going and ensures your feet will be wet. But, here again, the views are worth it, and you get treated to an aid station when you’re finally done descending. Nine kilometers still remain, and they feature a gentle climb through a swampy forest with a fun descent that can best be described as a “choose your own adventure” trail. There are options everywhere. Thankfully, they all point to the finish. The “Grand” ultra event is a combination of the Pitschen and the Media loops: first the long course and then the 16-km as a sort of victory round. You might want to have a change of shoes waiting for you in between the loops, since the 30-km course featured some trails that had turned to rivers. Fortunately, the 16-km loop was totally dry. I brought a second set of shoes — it was my first time changing shoes mid-race, and it proved to be my best decision of the day. If you’re considering running Engadin St. Moritz Ultraks and have doubts about which course to select, sign up for the Grand course. You get a little over ten hours to finish, and you won’t miss the views on one side or the other. However, be prepared: 46 km might not sound like a big ultra, but add 3,000 meters of vertical and the effects of running at altitude, and suddenly it’s much more challenging. The same advice holds for the shorter courses. Namely, do your hill repeats to be able to enjoy race day, instead of experiencing a suffer-fest. Come prepared, and Engadin St. Moritz Ultraks will not disappoint! Pro tip: Take your camera with you. Your friends will be envious of your amazing Facebook photos. For more information, see the Engadin St. Moritz Ultraks website. Food/drink available: Tea, cola, water, energy drinks, bananas, oranges, dried fruit, chocolate, crackers, mule bars and rye bread. Number of friendly volunteers: A million. Okay, maybe that’s a bit overstated, but there were smiling faces everywhere! Post-race meal: Pasta with red sauce or pesto. Vegetarian and vegan-friendly. Swag: Commemorative Engadin Ultraks Buff for all, and a microfiber sports towel as a finisher gift.